Israel and 1948: Did Israel plan to expel its Arabs in 1948? Or not? Did Israel actually plan to expel most of its Arabs in 1948? Or not? The following is adapted from Gershom Gorenberg’s new book The Unmaking of Israel. Tomorrow, Slate will publish an excerpt about why a new kind of old-time Judaism has taken hold in Israel. The day after, we will publish an excerpt about how Israel can resolve its tragic crisis with the Palestinians. Soldiers defend Jerusalem in the War of Independence. Photograph from the The State of Israel-National Photo Gallery. The most basic question about Israeli democracy has existed from before its birth: What would be the status of Arabs in a Jewish state? The answer is riddled with contradictions. On the surface, the partition of Palestine approved by the United Nations in November 1947 offered a straightforward way to deal with two national groups claiming the same territory: Each would get part of the land. The problem with that solution was the same one faced in drawing borders between nation states in Europe after both world wars, or in partitioning the Punjab between India and Pakistan in 1947. No clean geographic line separated the groups that were to be divided. They lived among each other. The U.N. plan for Palestine gave 55 percent of its territory to the Jewish state and 40 percent to the Arab state, with Jerusalem as an international enclave. In the area designated for the Jewish state lived 500,000 Jews and 450,000 Arabs. Another 100,000 Jews lived in Jerusalem, and a small number in scattered communities in the land assigned to the Arab state. Given those numbers, and given what happened to the Palestinian Arabs in 1948, it is easy to conclude that the founders of the Jewish state adopted a policy of expulsion and proceeded to carry it out. The conclusion, however, suffers from the fallacy of intent—assuming that if things turned out a certain way, someone planned it that way. More subtly, it fails to distinguish between political mood and explicit policy. The partition map was based not only on the 1947 population of Palestine. It assumed that the Jewish state would absorb up to half a million European Jewish refugees, who did not want to want to return to their pre-Holocaust homes and were not wanted there. In this sense, the argument that the Palestinians paid for Europe’s crimes is correct. Nor were the European refugees the only prospective immigrants; the founders of Israel hoped to “ingather” Jews from around the world. Even so, Zionist leaders were concerned about the expected size of the Arab minority. A good example of that concern is an October 1947 telegram from Moshe Shertok to David Ben-Gurion. Shertok was the “foreign minister” of the Jewish Agency, part of autonomous government of the Jewish community in Palestine; Ben-Gurion was head of the Agency. Shertok was in New York, where the final version of the partition plan was being hammered out. The plan allowed Arabs living in the Jewish state to opt for citizenship in the Arab state or the Jewish state, and for Jews living in the Arab state to do the same. Jerusalem residents could also choose to be citizens of one of the states. Were the U.N. plan to include a population transfer, that would be ideal, Shertok implies, but this was not in the cards. Since the Arabs would stay put, it would be best if they chose citizenship in the Arab state, so that they would not be able to vote in the Jewish one. Meanwhile, the Jewish political majority would be boosted by Jews living outside the state. It should be no surprise that Zionist leaders thought about transfer. Population transfer—less politely, the forced uprooting of men, women and children in order to create ethnically homogenous states—was part of the Zeitgeist. The original British proposal for dividing Palestine, submitted by the Peel Commission in 1937, included transfer of Arabs out of the Jewish state, and cited the forced exchange of 1.3 million Greeks and 400,000 Turks in 1923 as a positive precedent. After World War II, that precedent became the brutal norm in Europe, as Tony Judt writes in his epic work Postwar: 160,000 Turks expelled from Bulgaria to Turkey; 120,000 Slovaks sent from Hungary to Slovakia in exchange for the same number of Hungarians going the opposite way: nearly 3 million Germans expelled from the Sudetenland in Czechoslovakia, with the approval of Britain, Russia and America. The full list is much longer. “The term ‘ethnic cleansing’ did not yet exist, but the reality surely did,” Judt writes. It was a crime against humanity, described as such at the time by morally awake observers, yet accepted by pragmatic statesmen as a necessity. All the same, the evidence is missing to back up the claim that the Jewish leadership planned from the start to expel the Arabs. In fact, there is strong evidence for the opposite: The leaders of the state-to-be expected and planned for the Arab population to stay put. That evidence comes from the report of the opaquely named body known as the Situation Committee. In October 1947, it was clear to the heads of the Jewish governing institutions in Palestine that the British Mandate would soon end. They needed to plan how to run a country—build roads, deliver mail, provide health care, maintain sewage lines. The Situation Committee was created in order to draw up a blueprint. Ben-Gurion chaired it. Other senior politicians, including Golda Meir, headed subcommittees that designed ministries, down to the number of district veterinarian officers and school inspectors, and the precise budget needed to pay them. In the Situation Committee’s final report, the chapter on education notes that the Jewish state would be responsible for the 11 existing Arab schools in the partly or completely Arab towns of Haifa, Tiberias, Safed, and Beit Shean, and the 92 schools serving the 248 Arab villages in the area of the Jewish state. The health chapter states that government clinics established by the British in Arab villages will keep operating; villages without clinics will be served by the Histadrut labor union’s clinics in neighboring Jewish communities, under government contract. The Interior Ministry, in charge of local administration, will have 24 district officers—16 Jewish and eight Arabs. The report is in Hebrew. It is not intended to impress outsiders. It is intended for use. The pre-independence musings among Zionist leaders about population transfer represented one political inclination. The Situation Committee report represented an opposing inclination, among the same people, for integrating a large Arab minority into the Jewish state. Events on the ground tipped the balance. The committee completed its report sometime between April 10 and April 30, 1948. By then, the sections referring to the Arab population were already dated, rendered obsolete by gunfire. 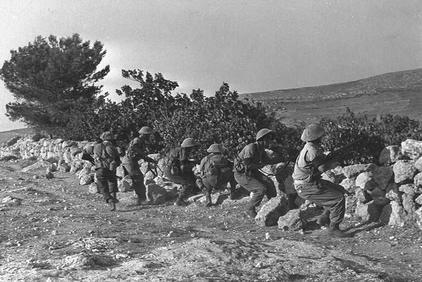 Fighting between Arabs and Jews in Palestine had broken out the day after the U.N. approved partition on Nov. 29, 1947 and steadily escalated. Both sides believed their survival was at stake. In the first months, the Arab middle and upper classes began fleeing their homes. Local Arab village militias cut the road to Jerusalem. Starvation loomed in Jewish areas of the city. In April—perhaps while a typist in Tel Aviv was working on the mimeograph stencils of the Situation Committee Report—the nascent Jewish army known as the Haganah went on the offensive. It aimed at taking control of the land assigned to the Jewish state, opening the road to Jerusalem, and preparing for defense against the coming Arab invasion. In some places, Jewish commanders expelled Arabs from conquered villages. In many more, panic led to mass flight, especially after fighters from Irgun and Lehi, far-right Jewish undergrounds, perpetrated a massacre in the village of Deir Yassin outside Jerusalem. By early May, Shertok was speaking of the “astounding” and “unforeseen” Arab exodus, as if describing an unexpected inheritance. Going back to the status quo ante was unthinkable, he said. When Israel’s provisional government discussed the issue in June, the consensus was to prevent the refugees from returning. The policy was partly defensive, to avoid a fifth column. But in the June cabinet meeting, Shertok also described all “the lands and the houses” as “spoils of war,” and as compensation for what Jews had lost in a war forced on them. Afterward, as the fighting continued, cases of the Israeli army expelling Arabs grew more common. The decision to prevent return was the turning point, transforming what began in the chaos of war into a choice. Arab forces also expelled or massacred Jews or prevented their return to places they had fled. But they could do so rarely, because the Arabs were losing on the battlefield. Nonetheless, Transjordan’s Arab Legion emptied the Jewish Quarter of Jerusalem’s Old City; Arab fighters massacred about 150 Jewish defenders of Kfar Etzion, a religious kibbutz south of Bethlehem, after they surrendered. With the war’s end and the signing of the armistice agreements, the Situation Committee’s blueprint for coexistence was less than memory. Tiberias, Safed, and Beit Shean were empty of Arabs, as were 350 or more villages that had existed in 1947. In Haifa, only a fraction of the Arab population remained. The same was true in Jaffa, Akko, Lod, and Ramle, towns that partition had assigned to the Arab state but were now part of Israel. About 150,000 Palestinian Arabs lived in Israel as defined by the armistice lines, less than a fifth the number who had lived in the same territory beforehand. The laws and policies adopted in Israel’s first years marked those who remained as citizens—and at the same time as outsiders and potential enemies. They were Israeli Arabs, or Arab citizens of Israel, or as they would be more likely to say decades later, Palestinian citizens of Israel—but not Israelis. Tomorrow: Why a new kind of old-time Judaism has taken root in Israel.